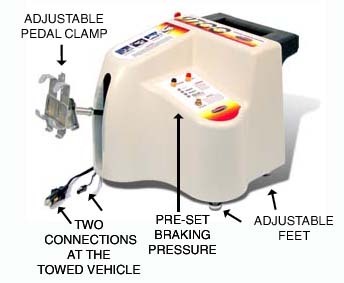 The 9700 is a portable supplemental braking system that applies a pre-set pressure to the towed vehicle’s brake pedal each time the motorhome’s brake lights are illuminated —simply push a button to select light, medium or heavy braking. Or, just as easily, the 9700 may be set to activate only in an emergency break away. The 9700 uses the electrical connections already in place on your towed vehicle (the towed vehicle’s electrical harness) to brake when you brake the motorhome — the same electrical signal that activates the towed vehicle’s brake lights also activates the 9700. • Activates only when the motorhome’s brake lights illuminate — no false activations! • The 9700 automatically delivers maximum braking pressure in a break away. • Does not accumulate water in the reservoir tank, unlike other systems — no puddles on the carpet!